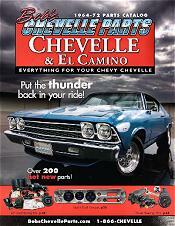 Bob's Chevelle Parts catalog is where classic Chevy owners score premium 1964 -1972 Chevelle restoration parts, from Chevelle interior parts to classic El Camino parts and more. Chevelle restoration parts - Bob's Chevelle Auto Parts catalog is the world's leading source for Chevelle restoration parts, featuring 1964-1972 Chevelle parts and accessories that will get your classic Chevy motors running once again. Whether you hope to restore, revamp, improve performance or bring in new accessories for your classic Chevelle, Bob will get your classic Chevy model back on the road and back in style. Chevelle interior - Find a wide selection of essential Chevelle restoration auto parts that will revive your Chevelle interior, making it look like new again. Shop by year for premium interior kits, seat covers, audio systems, carpet sets, Chevelle interior trim items, arm rests, seat belts, sun visors, steering wheels, console parts and hundreds of other auto parts that will perfect the look and feel of your Chevelle from the inside out. Chevelle body parts - From body repair panels to bumpers, body moldings to body hardware, Bob's brings you the Chevelle body parts that your classic Chevy's body is aching for. Find everything you need for your Chevelle interior and exterior including exterior trim, emblems, auto glass, rubber weatherstrips, body seals and more! Even more Chevelle auto parts - No matter if you're having engine problems, air conditioning issues or need a new cooling system, you'll find the Chevelle restoration parts that will provide a quick fix for any problematic Chevy situation. From suspension to transmission, brake components to fuel systems, Chevelle interior or exterior repairs, Bob's Chevelle Auto Parts catalog has what you need and always in stock. Whether you're shopping for 1972 Chevelle parts, accessories for your 1965 El Camino or classic Chevelle parts for your beloved 1964 Chevy model, you'll find everything you need for your Chevelle interior, exterior and under the hood, all in one place. If you're in the market for classic El Camino or Chevelle restoration parts, Bob's Chevelle Auto Parts catalog is always at your service.